Many TV viewers in the U.S. and around the world assume that with the introduction and acceptance of Digital TV and HDTV broadcasting and source devices (such as Blu-ray disc players and media streaming), the old barriers to a universal video standard have been removed. However, despite the fact that video is now mostly digital, the fundamental difference between video standards that existed under analog systems, frame rate, is still the foundation of Digital TV and HDTV standards. In a video (both Analog, HD, and even 4K Ultra HD), just as in a film, the images you see on a TV or video projection screen look like complete frames. However, there are differences in the way frames are transmitted by broadcasters, transferred via streaming or physical media devices, and/or displayed on a screen. Video images that are either broadcast live or recorded, are composed of scan lines or pixel rows. However, unlike film, in which the whole image is projected on a screen at once, the lines or pixel rows in a video image are displayed across a screen starting at the top of the screen and moving to the bottom. These lines or pixel rows can be displayed in two ways. The first way to transmit or display images is to split the lines into two fields in which all of the odd numbered lines or pixel rows are displayed first and all of the even numbered lines or pixel rows are displayed next, producing a complete frame. This process is called interlacing or interlaced scan. The second method, which is used in LCD, Plasma, DLP, OLED flat panel TVs and computer monitors, is referred to as progressive scan. Instead of displaying the lines in two alternate fields, the lines or pixel rows are displayed sequentially. This means that both the odd and even numbered lines or pixel rows are displayed in numerical sequence. The number of vertical lines or pixel rows dictates the detail in the image. The larger the number of vertical lines or pixel rows, the more detailed the image. The number of vertical lines or pixel rows is fixed within a system. The two main analog video systems are NTSC and PAL. NTSC is based on a 525-line or pixel row, 60 fields/30 frames-per-second, at 60 Hz system for transmission and display of video images. In this system, each frame is displayed in two fields of 262 lines or pixel rows that are displayed alternately (interlaced). The two fields are combined so that each frame of video is displayed with 525 lines or pixel rows. NTSC was designated as the official analog video standard in the U.S., Canada, Mexico, some parts of Central and South America, Japan, Taiwan, and Korea. PAL has been the dominant format in the World for analog television broadcasting and analog video display. PAL is based on a 625 line or pixel row, 50 field/25 frames a second, 50Hz system. The signal is interlaced, like NTSC into two fields, composed of 312 lines or pixel rows each. Since there are fewer frames (25) displayed per second, sometimes you can notice a slight flicker in the image, much like the flicker seen on projected film. However, PAL offers a slightly higher resolution image and better color stability than NTSC. Countries with roots in the PAL system include the U.K., Germany, Spain, Portugal, Italy, China, India, Australia, most of Africa and the Middle East. Although the increased resolution capability of digital format broadcasting and high definition video software content standards are a step up for consumers, when comparing HDTV to analog NTSC and PAL standards, the fundamental common foundation of both systems is the Frame Rate. In NTSC-based countries, there are 30 separate frames displayed every second (1 complete frame every 1/30th of a second). In PAL-based countries, there are 25 separate frames displayed every second (1 complete frame displayed every 1/25th of a second). These frames are either displayed using the Interlaced Scan method (represented by 480i or 1080i) or the Progressive Scan method (represented by 720p or 1080p). With the implementation of the Digital TV and HDTV, the foundation of how frames are displayed still has its roots in the original NTSC and PAL analog video formats. In soon-to-be former NTSC-based countries, Digital and HDTV are implementing the 30 Frame-per-second frame rate, while former PAL-based countries are implementing a 25 Frame-per-second Frame rate. Using NTSC as a foundation for Digital TV or HDTV, if the frames are transmitted as an interlaced image (1080i), each frame is composed of two fields, with each field displayed every 60th of a second, and a complete frame displayed every 30th of a second, using an NTSC-based 30 frames-per-second frame rate. If the frame is transmitted in the progressive scan format (720p or 1080p) it is displayed twice every 30th of a second. In both cases, a unique high definition frame is displayed every 30th of a second in the former NTSC-based countries. Using PAL as a foundation for Digital TV or HDTV, if the frames are transmitted as an interlaced image (1080i), each frame is composed of two fields, with each field displayed every 50th of a second, and a complete frame displayed every 25th of a second, using a PAL-based 25 frames-per-second frame rate. If the frame is transmitted in the progressive scan format (720p or 1080p) it is displayed twice every 25th of a second. In both cases, a unique high definition frame is displayed every 25th of a second on TVs in former PAL-based countries. Digital TV, HDTV, and Ultra HD, although a big leap forward in what you actually see on a TV or projection screen still has roots in analog video standards that are more than 60 years old. 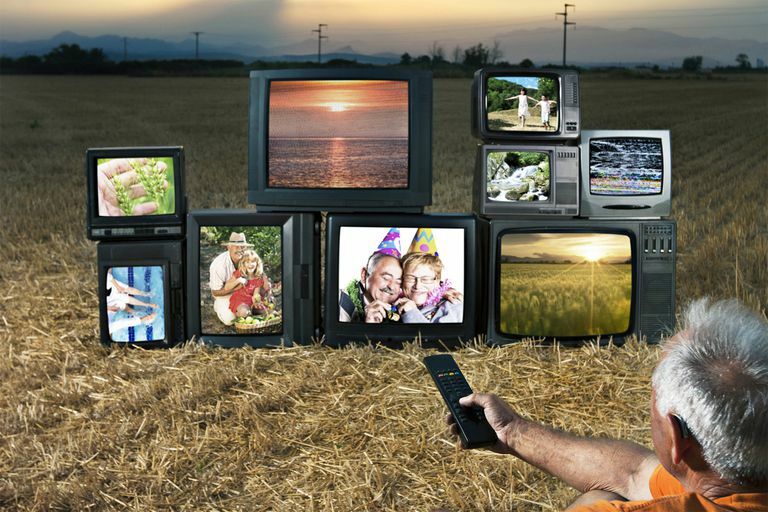 As a result, there are and will be, for the foreseeable future, differences in Digital TV and HDTV standards in use throughout the world, reinforcing the barrier to true worldwide video standards. Also, as conversion continues towards digital and HD only transmission, many still have NTSC and PAL-based video playback devices, such as VCRs, analog camcorders, and non-HDMI equipped DVD players plugged into HDTVs (and even 4K Ultra HD TVs). In addition, even with formats, such as Blu-ray Disc, there are cases where the film or main video content may be in HD, but some of the supplementary video features may still be in the standard resolution NTSC or PAL formats. DVDs are all made in either the NTSC or PAL formats. It is also important to note that although 4K content is now widely available via streaming and Ultra HD Blu-ray Disc, 4K TV broadcast standards are still in the early stages of implementation, video display devices (TVs) that are 4K-compliant still need to support analog video formats as long as there are analog video transmission and playback devices in use. Also, be warned that 8K streaming and broadcasting may not be that far off. Eventually, you may no longer be able to use analog video devices, but that day isn't there quite yet. Can DVDs I record be played anywhere in the World?